The name of this site may be birdsofnewengland.com and the hobby may be called birding, but most birdwatchers, myself included, are always on the lookout for any type of wildlife. In fact, my interest in this hobby got its start by my fascination with a non-bird wildlife species: moose. Some of the interesting non-bird wildlife frequently encountered while roaming New England’s woods, fields and bodies of water include beaver, mink, otter, muskrat, and fisher — just to name a few. Oh, and white-tailed deer, of course. In some areas of New England, such as southwestern Connecticut, deer are so plentiful they are seen as pests by some residents. In most areas of the region, they are revered as the magnificent animals they are. 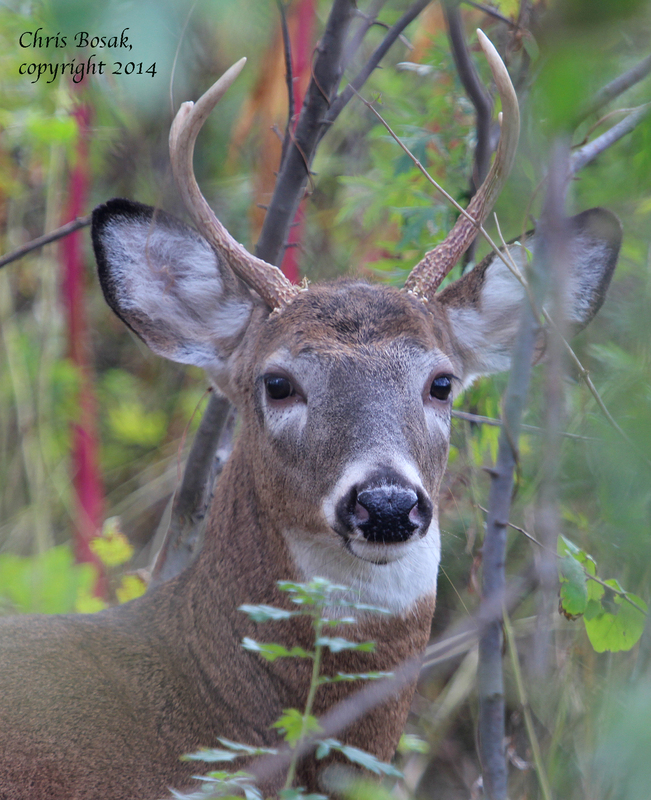 I came across this handsome fellow the other day while looking for birds at Sherwood Island State Park in Westport, Conn.
A young White-tailed Deer in Stamford, Oct. 2014. I was looking for birds, of course, but this young buck (literally) was just off the trail and seemingly unfazed by my presence, so I grabbed a few shots of him. You never know what you’ll see out there. I found this guy at Cove Island Wildlife Sanctuary. Here’s a column I wrote about a year ago that ran in The Hour (Norwalk, Ct.) and The Keene Sentinel (Keene, N.H). It is about finding baby deer that are “abandoned” — but not really abandoned, of course. Since it is that time of year again when people may stumble across baby animals, I figured I’d put this column out there again. 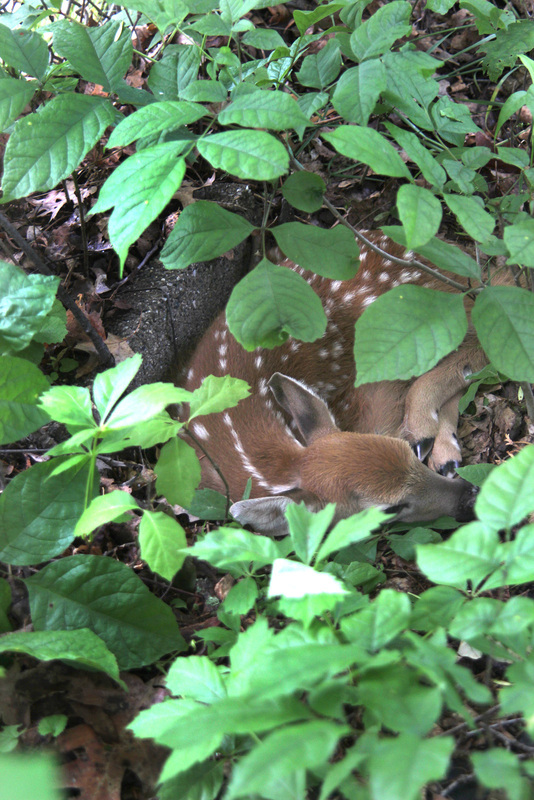 A fawn hides in the woods, June 2013. What do old tennis balls, my boys’ penchant for baseball, and a nearby school have to do with this nature column? Hang in there, you’ll find out soon enough. First, let’s back up to winter. During snowless winter days I like to wander around the woods surrounding tennis courts and collect as many old tennis balls as I can. My boys used to love to join me in this endeavor. Now they kind of just tolerate the venture. So why would I spend time and put up with the invariable scratches that come with such an outing? To have plenty of fodder for batting practice in the backyard. I live next to a school and the property is divided by a chain link fence about eight feet high. It makes for the perfect home run derby fence. I don’t have the bank account to fix all the broken windows that using a real baseball would cause, so we use old tennis balls.